Why we work the single leg squats is to allow you to squat low enough to feint the guard pull but allow you to change direction and shoot instead. A specialty of my our coach, Chris Haueter. Been real busy recently, work, gym, family, travelling so time to kick back and relax with one of the finest bands of our time. This is the best live version I could find but check out the studio version if you can. Ladies and gentlemen, may I present Bad Brains. The last couple of months have been trying but now am fit to resume training, privates and seminars. Hopefully now I'm back, for a little while at least. In wrestling and Judo the purpose of the sport is basically to get the takedown or throw, then it’s game over. Jiu Jitsu is totally different, getting to the ground is just the start not the end. Therefore the baiana, whilst resembling shooting a double or Judo’s morote gari, is different because whilst the purpose is still to take it to the ground you have to consider the position you will land in when you get there. The lift and twist of the baiana is crucial as you are effectively passing guard in the air and saving yourself a lot of trouble later down the line. So remember, as you lift to get the takedown pull your arms across one way and use your head to push the other way as the video above. Also note the angle in which you approach the takedown and the angle in which you are driving. In the first example, you level change correctly by bending the knees. Keeping the driving force parallel to the ground so if your opponent moves back you can still drive through. The second example is the INCORRECT way. 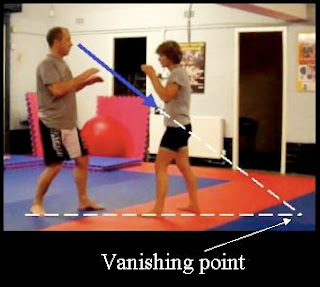 By bending forward and grabbing at the legs instead of level changing you are creating a downwards-diagonal force that has a vanishing point and therefore you cannot go any further than that. This will assist your opponent in sprawling on you so should be avoided unless that is your game plan. A great drill for working your balance. Sitting to kneeling to combat base to standing and back down again. The kneeling and combat base part should be drilled as much as possible, you will often find yourself kneeling down in base with an opponent trying to off-balance you, this exercise get you used to having to quickly re-establish base and balance. The standing part works the stabiliser muscles and makes the squat part way more difficult. It also works the adductors as you are having to hold the ball with your feet. You have to squat while fighting the multi-directional forces wanting to pull you around. Grab a ball and start experimenting. Please note that the first clip is the way to initially start training this technique, don’t push away your partners hands until you feel comfortable that you wont drop them on their head or your head. Don’t push their hands away until they are able to do a breakfall roll as to minimize the risk of injury. *Make sure you have double sleeve control to start with. *Put one foot into the hip and sit back on an angle, not straight back. *Drive the heel of the foot into your partner’s hip as you pull with both hands to create pressure. The success of this technique at this stage relies upon the push/pull. *NB do NOT fully stretch out the leg, you should never lock the leg right out. *When you are ready, bend the leg in your partners hip so they start to come forward then bring your other foot into play. *Break their balance forward and take their weight onto both feet. *As you start to roll backwards, push both of their hands away from you so they cannot post. *In this technique you stay attached and follow them over, other options are available. Good article, a must read for people that are injured as much as me. Can't link it for some reason, copy and paste into a browser. Nice article here from Grapple Arts web site. I found the jiu-jitsu much more "feint" oriented as opposed to straight ahead pressure. The majority of the techniques were explained in the context of setting it up with pressure to one direction and then reversing to take advantage of your opponent's reaction. The softer, more flowing style of jiu-jitsu was described by Ari as more pure jiu-jitsu - that is to say in Brazil, there was less influence of other arts like wrestling in the jiu-jitsu. No one had stripes on their belts. The majority of the blackbelts were not competitive wunderkind - rather, guys who just had been training for a long time. I felt that people were less concerned with "who tapped who" or needing to establish the pecking order than in North America. And in my experience, England is even worse than USA for this attitude so forget "who tapped who" and just train to get better and have fun. Another competition over and more competitors walk away with medals they don't deserve. Why do you say that I hear you ask? All the no gi competitions are basically based on trust when it comes to training time and which division to enter. If a competition says novice is under 2 years then only enter novice is you have trained under 2 years otherwise what is the point? If you are an experienced guy but don't feel you can go into advanced division for some reason then you need to take a look at yourself and your training. If you don't think you can compete at that level and are really scared to try in case you lose then don't but FFS don't go into novice just to get a medal to feel good about yourself and spoil it for genuine novices. Do you really not understand that it is CHEATING. Even worse if the coaches know about it and support it too. One of our guys, Mikey, won a tourney last time and just got his blue belt. When he entered the tourney this time he entered advanced as a test, he could have entered novice again as he has trained less than 2 years but what would have been the point!! These guys that are scared to go into the correct peer groups should take a look at the ladies from Leicester Shootfighters. They will jump in and compete against anyone even the men, they are always out-weighed and out-strengthed yet they go in and give it their best shot. Caz must be about 50kg and will still compete under 70kg against men!! Who do you think comes out of it with the most credit? The ladies who fight anyone regardless of size, weight, gender etc or the guy who steals gold in the novice division because he can't compete with his peers?